I have often wondered and marveled at the miracle of modern science and one of the things that fascinated me was that of the emergence of touch screen phones and laptops. So I did a little research into the topic and below is a summary of what I have found out. Think of the screen as a multilayer sandwich. On top is a thin plastic or glass sheet with a resistive coating on its bottom. The plastic or glass floats on a thin layer of nonconductive oil, which rests on a layer of glass coated with a similar resistive finish. Thin bars of silver ink line the horizontal and vertical edges of the glass. Direct current is applied alternately to each pair of bars, creating a voltage field between them. When you touch the stylus to the screen, the plastic pushes down through the gel to meet the glass (called a 'touchdown'). 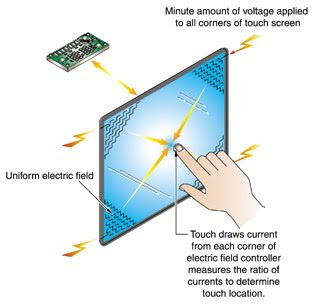 This causes a change in the voltage field, which is recorded by the touch screen's driver software. By sending current first through the vertical bars and then the horizontal ones, the touch screen obtains the X and Y coordinates of the touchdown point. The driver scans the touch screen thousands of times each second and sends this data to any application that needs it. In this way, a Phone or Laptop knows when you're tapping an on-screen icon to launch a program or gliding it across the screen to enter data. That's pretty neat! I guess I never really thought much about how it works before! The flood victims are in my thoughts and prayers! Good to know that you weren't in the worst of it!